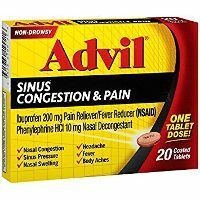 Advil Sinus Congestion & Pain is the only over-the-counter cold and sinus medicine that combines the speed and strength of Advil and a proven nasal decongestant so you're treating both major symptoms of a cold - pain and congestion. I have tried it and it does dull the thumping in my head. Migraines are bad enough. Add the thumping and you think you are really going crazy. Advil does the trick.